At this very moment, your body is shuttling oxygen through the bloodstream using a complex conveyance system. The transporter entrusted with this life-giving cargo, is called: haemoglobin. Haemoglobin is no mere ‘mule molecule’. It does more than simply carry oxygen; it pilots red blood cells, reacts to prevailing body conditions, and determines whether oxygen should be locked away in proteinaceous chains, or offloaded to bystander tissues en route. In order to manufacture haemoglobin, your body needs iron. When you eat, you are using your knife and fork to mine for iron. Once extracted from the diet, this iron is used to make haemoglobin. 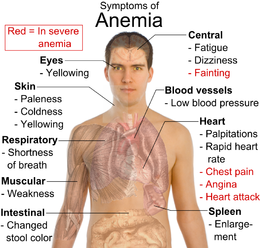 Iron deficiency anaemia occurs when there is an insufficient amount of iron in the body to make haemoglobin. It is the most common nutritional disorder worldwide, and any disruption to the iron supply chain can cause it (inadequate iron intake, decreased iron absorption, increased iron demand, or increased iron loss). Many people with iron deficiency anaemia have little to no symptoms. Others will feel tired, dizzy, or weak; especially if they exercise. Less common symptoms include restless legs syndrome, pica (i.e., craving to eat clay or dirt) and pagophagia (i.e., craving to eat ice). The first step in treatment is to find out whether anaemia is caused by blood loss (i.e., loss of red blood cells and the haemoglobin in them). In women, blood loss is often linked to heavy periods. All women with heavy menstrual flow should have pregnancy and thyroid tests done, while some may need an endometrial biopsy. In men–and in women who no longer have periods– iron deficiency can result from stomach ulcers, bowel problems, or previous bowel surgery (e.g., gastric bypass). Celiac disease testing, gastroscopy, and colonoscopy are sometimes needed to make a diagnosis. Anaemia is easily detected on routine blood tests, such as the complete blood count, or “CBC”. A low haemoglobin value and small cells (iron-deficient red blood cells tend to be small) will prompt a doctor to look for evidence of low iron stores. Iron is stockpiled in a protein called ferritin, making ferritin the most accurate test to diagnose iron deficiency anaemia. Unfortunately, patients with inflammation or infection may have high ferritin, despite low iron stores. In such cases, further tests can be performed to ascertain iron status. “Iron studies” consistent with iron deficiency include: a low serum iron level, low transferrin saturation, high total iron-binding capacity, and increased soluble transferrin receptor (the latter test is unaffected by inflammation). Most people with iron deficiency anaemia need to take extra iron. Dietary sources of iron are insufficient to correct anaemia, so the iron used in treatment comes in pills or as a shot. Iron pills can cause side effects such as upset stomach and constipation. If you experience side effects, consult your doctor prior to abandoning treatment. See your doctor regularly to follow your progress. An increase in haemoglobin of 1 g/dL after one month of treatment shows an adequate response to treatment and confirms the diagnosis. In adults, therapy should be continued for three months after the anaemia is corrected to allow iron stores to become replenished.